How do I share clients, exercises and/or protocols with my colleagues? If you work in a multi-provider clinic, sharing clients, exercises and protocols with colleagues is a great way to ensure your entire team has visibility. Sharing clients also means your colleagues can update your clients' exercise programs (e.g. when you are away). Login to your Physitrack account. Go to My account > Sharing. Add the e-mail address of the colleague(s) you want to add to your share group. Note: the colleague has to be a subscriber to Physitrack. 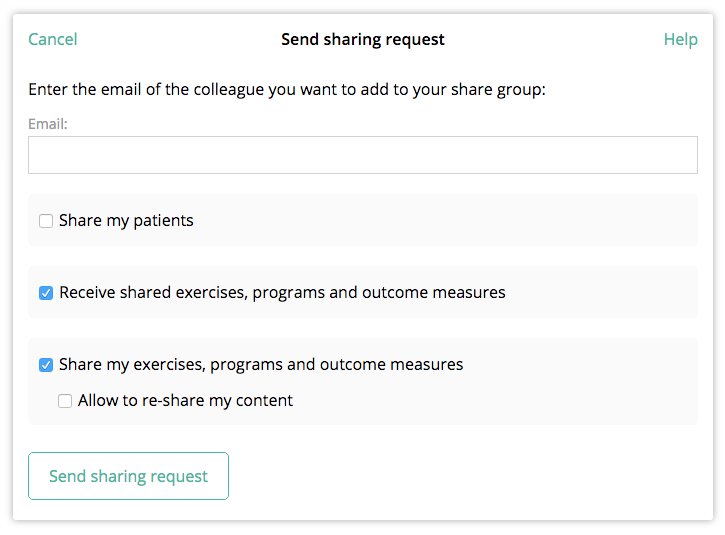 Select whether you want to share clients and/or exercises/protocols/outcome measures. Your clients and/or exercises/protocols/outcome measures will now be fully accessible to your colleague(s) in Physitrack, and vice-versa.